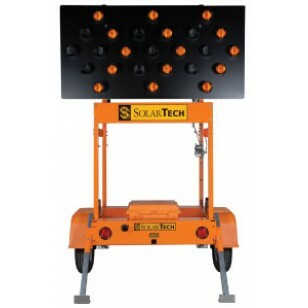 The Silent Sentinel is a 25 lamp solar powered Advance Warning Arrow panel for traffic direction. Trailer mounted for easy transport and quick set-up. The equipped control module displays battery level, solar charge status, lamp intensity settings and has a built-in fully automatic solar charge controller (temperature compensated). Display options include left or right arrow patterns set to flashing or sequential with a flash rate of 30 per minute. You can also set the LED lamps intensity manually or use the auto-dimming feature which provides optimal visibility with minimal energy consumption. Featuring industry leading LED lamps - Independent laboratory tests confirm our custom LED lamp is the brightest in the industry and has the greatest overall angularity. Ideal for lane closures, traffic redirection and temporary work-zones.